The complete Vela layout with expanded pages, a true lay-flat, permanent binding, and a durable case with heavyweight, rigid bookboard. A smart, layout constructed around user surveys, and refined by real world use in the lab. Featuring an annotated user information block on the first page for quick reference, followed by standard user guide, full user and book information block, 4 pages of pre-numbered index, 134 numbered pages, abbreviation and accessory data tables, and standard conversion and reference charts. The cover of our standard Hardcover lab notebooks are printed and laminated, and while the scuff resistant matte laminate is resistant to water and most solubles commonly found in the lab, some strong acids and bases may compromise the cover after prolonged exposure. Due to the nature of laminates, some wear and finger prints will show over time. To reduce this, wipe with a damp cloth, or try quick cleaning with WindEx. If fingerprints and scrapes are a concern, we highly recommend upgrading to DuraCover or Procover Vela notebooks. 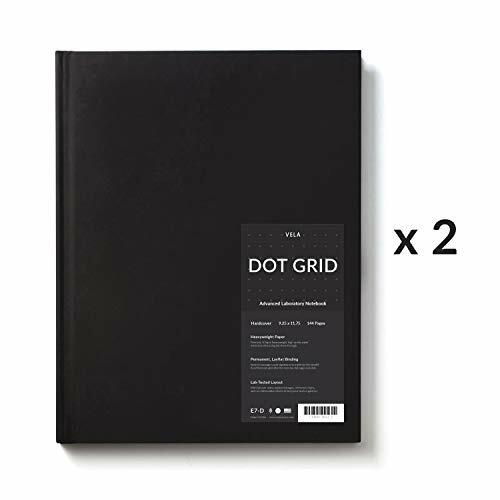 Vela Hardcovers feature tamper evident, permanent, Smyth sewn binding-small page count registers to maximize durability, flexibility in the spine, and promote pages that lay more flat. This type of binding is not susceptible to page pulls, or spine cracking, or deterioration, and the more you use the book the more the pages will lay flat. The 105 gsm heavyweight, archival quality paper is noticeably heavier than that found in most lab notebooks. This heavier paper works to reduce ink show through and lends itself to a more durable, lasting book. This paper is also manufactured Elemental Chlorine Free and is SFI certified. If you have any questions about this product by Vela Sciences, contact us by completing and submitting the form below. If you are looking for a specif part number, please include it with your message.